Lead nurturing | Be Ready For Service! How To Book More Events with Business Cards! Great caterers hear this request at events often. Every caterer is constantly looking for new business. Unfortunately many caterers miss countless opportunities everyday at events to easily convert guests into clients. 1. The request for business cards is confirmation that the events’ presentation, food and service are being noticed and appreciated by the guests. Outstanding — Go ahead and pat your self on the back! 2. This card request is a grand opportunity to start the sales process of converting an interested and uniquely positioned guest into a client. 3. Guests view the card request as a permission based inquiry, meaning the prospect (guest) has asked you (given permission) to engage them. Don’t blow it. Just image good-looking girls asking out nerdy guys on dates — it does happen. In most cases, sales people, managers and owners carry business cards. They are bound to be passing out a card here and there. Too often though, business cards are left at the office, in a van, in their car parked far away or maybe stuffed in the event folder — if you are lucky. That’s about the change with this simple and effective “closed loop” program that helps turn “hand raisers” into clients. With this proven approach to capturing the hand raisers, you will find your event staff (servers, bartenders, and valet) enthusiastically helping the sales staff in their quest for more new business. The technique explained here beats the pangs of rejection associated with cold calling any day. Order at least 2,000 business cards for each member of the sales staff. In practice, when requested by a guest, the event staff will be giving them a business card of the person who sold the event they are working at. You’re saying, “That’s a lot of business cards and a lot of money.” Business cards are an inexpensive medium for engaging new business when handled properly. Several cards will never be handed out — it happens… look how many cocktail napkins get wasted on events. Now is not the time to go cost crazy. All of the event staff must be carrying at least two business cards each when working on events. When they run out of cards they can always get more. I have seen a few large stellar over-the-top “A Game” events where the entire event staff ran out of cards several times; so always carry back ups. 1. Give the staff, a gift certificate, movie tickets some sort of tangible reward to acknowledge that they handed out a card, that with some good follow-up by the sales staff, an event was booked, because they handled out a business card correctly. There are some online services that let you buy debit cards, gift certificates, and gas cards in small volumes at a discount. So look around and be creative and mix it up. Remember perceived value makes a big difference. Word will travel fast among the staff about this double-header reward program. Say this to event staff at the pre event meeting. You’ll always see hands raised. Continue with, “Great, here’s how you get yourself more work. I’m passing around business cards. I want you each to take two cards and write “Thank you” and neatly print, your name on the back of the card now. Now you see the full circle and therefore closing the loop. You must track the lead inquiry sourcing carefully, this is important, for several reasons. You will find that an incremental lift in booking more than offsets the small investment in additional business cards and some recognition trophies. This program does not mean the event staff goes “Gonzo” handing out cards madly left and right. Like all permission based engagements this process and relationship starts when the prospects; a guest in this case, ask for a business card. In either case, the odds are improving that the company will likely get another event because it has already started the sales process of converting prospects into a client. Don’t forget: The request was based on the superior performance. So, continue to focus on the overall performance and the request for cards will come. Instruct the sales staff to get the event staff’s name on the back of the card when they are talking and qualifying the caller. 1. Which member of the staff handed out the card? Now you know who to reward. There ought to be a space right on your lead-prospect qualification form to write the name in. 2. Where the business is coming from. Now the sales person knows how to interact with the caller. If the caller has already seen a presentation, tasted the food and experienced the service — the sales process will be smoother. All of the sales staff needs to do this and they will reap huge rewards, as will the event staff and the company. In the beginning, the time span from handling out cards to booking an event may be lengthy – so you might need to “prime the pump” by providing some recognition initially to those handing out cards that calls to be made to the office. At the very next pre event meeting acknowledge and reward publicly the event staff members who have been handing out cards that caused calls. This reinforces the good activity. Later you can just acknowledge only the booked events. Sending an email to all the event staff acknowledges the process is working and reinforce the behavior. Later on every one will know what to do. However be sure to inform new staff and keep rewarding the positive behavior. The reward is away to reenergize the staff. Remember: Business card requests generate calls. Calls create proposals. Proposals turn into events! This improved process will take a little while to get going and the quicker bookings will follow. The event staff wins, the sales person wins and the company really wins, by being prepared to hand out business cards when requested. 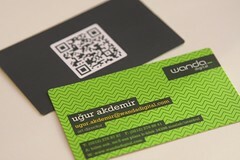 If you want to kick it up a notch — you might consider updating your business card to the new QR (box Code) style cadr. QR codes are edgy and perhaps the newest tools for social media engagement. Check out the new 40 interactive cards for inspiration and sensory overload at trendhunter.com. Any one of these new tactile and digital combinations will certainly make the bearer memorable.